Inspiring women to develop an outward style to reveal their inner beauty! It is that time of year again! Cooler weather is fast approaching. I recommend going through your closet twice a year (in the early spring and early fall) and re-evaluating what you have in there. You should only keep the things that make you look and feel your very best! I have posted this before but I thought you might need a refresher or a reason to get encouraged to tackle that closet again. Your closet is one of the fastest places to get cluttered but it should be one of the most valued spaces in your home because it contains all the clothes that make you look and feel fabulous! Set aside plenty of time to organize your closet. If you don’t have time to do it all at once, take a section at a time. Try on everything and make sure it still fits, it is still in style, it is still in good shape, it is your best color and fits your body type, you have things to go with it and it is something you would buy today. Make piles for “Keep”, “Mend”, “Donate” and “Toss”. Don’t forget to do the same thing with your underwear, bras, shoes, purses, belts, scarves and other accessories. Clean and Laundry everything that needs it before putting back in the closet. If things need to be mended, make sure you do this as quickly as possible. Take the things to be donated to your car so you can drop them off the next time you are out. Get rid of the items in the “Toss” pile immediately. Put all “Keep” items back in your closet. 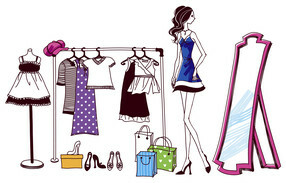 You can decide how to place the items back in the closet based on what will suit your needs best. Separate by season and then you can separate by purpose, type, length, style or color or a combination of these. Hang as much of your clothing as possible where you can see each garment easily. If it is in a drawer out of sight, it is out of mind and will seldom get worn. Remember if you bring in something new, something old needs to go out. Use the same type of hangers and make sure all items are hanging in the same direction. Stuff boots with rolled up magazines or boot trees so they retain their shape. Stuff handbags with tissue paper and store on a shelf. Leave breathing room in between items so they aren’t jammed in to prevent wrinkles. Store small, loose items like socks, lingerie, bathing suits, pantyhose, etc. in drawer systems, baskets or clear plastic containers. Hang accessories on hooks in your closet. Take shoes out of their original boxes and store on some type of shoe rack. Keep a basket in the closet to place items to take to dry cleaners. Keep a small wastebasket in the closet. Fill a small basket with last minute fix-up items: lint brush or roller, pin-cushion, small scissors, etc. ← More Spring & Summer 2015 Trends! More Spring & Summer 2015 Trends!